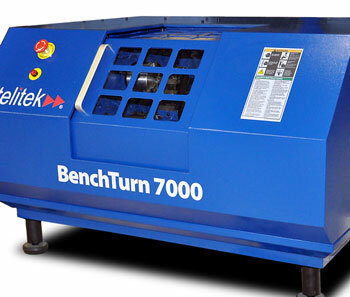 Over the past three decades, Intelitek has established itself as the leader in educational CNC (Computer Numeric Control) machines, with over 13,000 CNC machines installed in educational institutions across the world. Our latest line of Bench and Pro series CNC machines push the envelope for ease-of-use and affordability. Coupled with interactive online e-learning courses with fully-integrated web-based simulations of our machines, we offer an unmatched solution for CNC technology training. The BenchMill 6×00 is a PC-based benchtop CNC machining center enabling robust CNC and advanced manufacturing instruction! A versatile PC-based benchtop CNC turning center designed for robust CNC and advanced manufacturing instruction! The ProMill 8000 is a 3-axis, PC-based mill with an optional 4th rotary axis, featuring AC servo motors! Introduces students to the fundamentals of CNC milling by working with interactive, simulated machining applications. Introduces students to the fundamentals of CNC turning with project-based activities with fully integrated simulations of the BenchMill 7000. Introduces students to the fundamentals of CNC by working with the ProTurn 9000 CNC machine. CNC Motion provides dynamic simulation and graphic tracking of intelitek´s CNC mills and lathes.